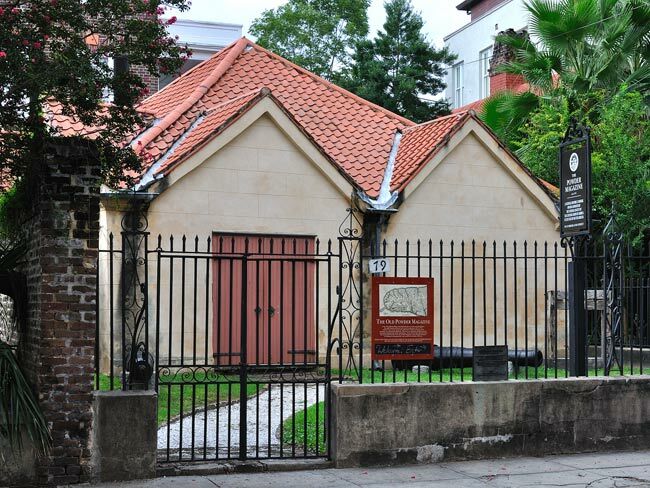 Th Powder Magazine, completed in 1713, is the oldest public building in South Carolina and likely the second oldest structure in Charleston. The oldest is believed to be the Pink House at 17 Chalmers Street, built around 1712. Both buildings share the distinct feature of a pantile roof, indicative of the city’s earliest structures. The magazine is also the only remaining government building from the time of the Lords Proprietors, founders of the territory of Carolina. The building was authorized in 1703 by the Commons House of Assembly and used as an arsenal from 1713 until 1748. The new colony feared attacks from Indians, slaves, the Spanish, and the French, and a storehouse of gunpowder – with 32-inch-thick walls – was deemed necessary for protection along with the city’s surrounding fortification. By 1720 Charleston was no longer under Proprietary rule, and with Carolina embarking on great success as a Crown colony – a “convention of the people” – the city no longer felt threatened by outside forces and removed the city’s wall. Subsequently, the magazine’s usefulness also waned, and by 1770 the building was condemned. However, it was revived during the Revolutionary War – or at least until a shell exploded within 30 feet of the building. After that near-disaster, the powder was moved to a different location. The magazine did store valuables during the war, including portraits of King George I and his queen. The former magazine served many different functions over the following decades, including use as a stable, print shop, and a carriage house. In 1902 the magazine was purchased by the National Society of the Colonial Dames of America in the State of South Carolina, preserving the historic building and converting it into a museum, as it remains today. 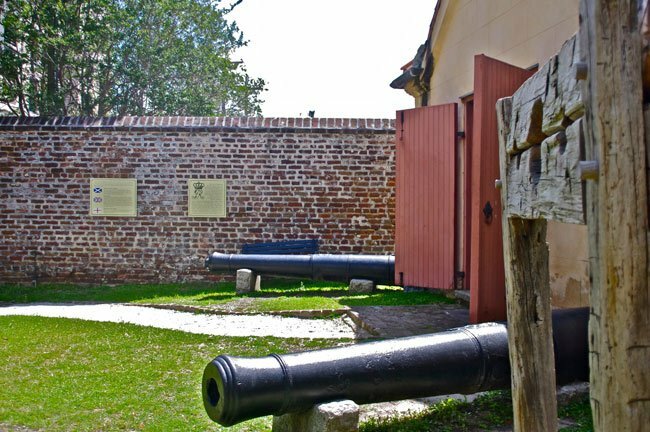 The Powder Magazine is a visible reminder of the era of the Lord Proprietors and their founding government of the Carolinas, of the fortifications which protected the city and made Charleston one of three fortified cities on the eastern seaboard of British Colonial America. It is the oldest public building in the state of South Carolina. Originally, the Powder Magazine was a brick building with a four-sided pyramidal roof intersected by two gables on each side. The roof tile is a Mediterranean type similar to that used on some of Charleston’s oldest buildings. This magazine was completed in 1713. Shortly after completion, it was found not to be sufficient to preserve the powder from rain. Repairs were made in 1717, and in 1719 the magazine was used as a storage place for public powder, as well as storage for all merchants and individuals in the city who sold powder. Further repairs were completed by 1740, when the building was stuccoed. The walls are 32 inches thick and interior walls have original brick finish. The original floor was likely packed earth or brick. The one main room is approximately 27 ft. by 27 ft. and has a central column formed by the descending arches of the vaulted ceiling. During the Revolutionary War the magazine was again used as a public magazine.